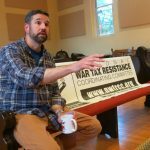 Podcast #7: “Why and How I Became a War Tax Resister” A series of interviews with people who started their war tax resistance in the year after the 2016 election. First, we speak with Caitlin, a Seattle-area war tax resister for whom Trump’s border wall plan was the final straw. Next, Sarah Mueller on her decision to resist and her conviction to redirect taxes toward community organizing led by people of color. Finally, Lauren von Bernuth and Orane Sharpe from the independent media website Citizen Truth. 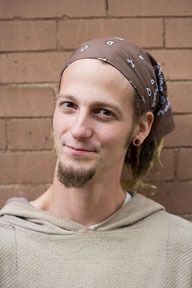 Podcast #4: “Talking with Shane Claiborne” In 2011, Shane Claiborne, Christian author and speaker and founder of the Simple Way community, announced his war tax resistance. In this interview, learn the surprising way the IRS responded to his resistance and more about the ideals that led Shane to live on a low income and to resist and redirect war taxes. Podcast #3: “Reflections of Experienced War Tax Resisters” features a collection of interviews of longtime resisters who share their histories of resistance and their motivations for taking this path of nonviolent direct action. Other Short Videos of War Tax Resisters as they explain why they refuse to pay for war, how they do it, dealing with fear of the IRS, and the empowerment of resisting taxes for war from 2005 plus bonus clip of Joan Baez in 1964 announcing her refusal to pay for the Vietnam War.